This action allows you to send notification messages to specified mobile device or desktop browser via Internet for free. Notifications will be delivered to the devices instantly through the Internet so you need to have connected to Internet device. To set up this action properly first of all you need get an Access Token. Simply copy and paste the Access Token from the Pushbullet Account Settings page on the Pushbullet website. You can send instant notification to all connected devices or just select one of them. 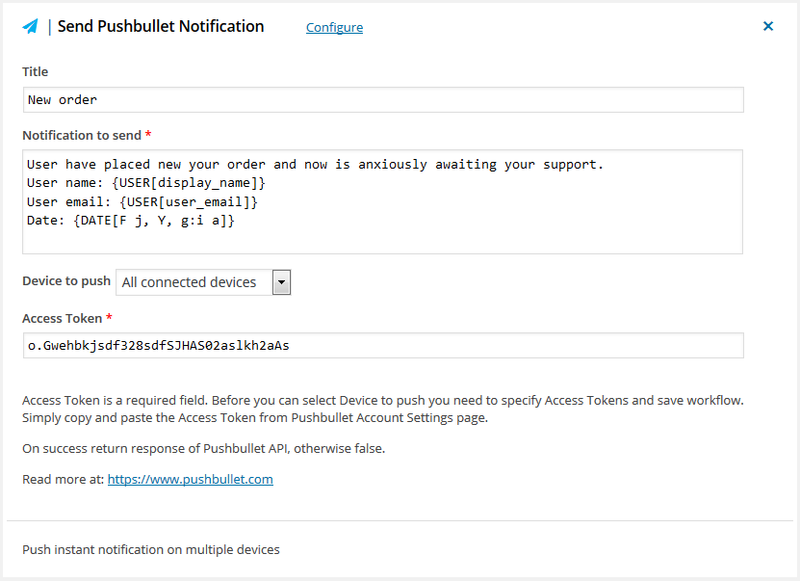 Before you can select Device to push you need to specify Access Tokens and save workflow. Having done that you will see a list of all your connected devices. To start receiving notifications in your desktop browser you need to setup special extension available for Chrome, Safari, Firefox and Opera. Find out more on the Pushbullet website. This action will return response of Pushbullet API on success, otherwise false. If notifications are not delivering as expected, check out Log page records for error messages.